Mountain UltraLight: One Container - Multiple Uses! It's a mug, a bowl, and a water storage container! Backpacking gear doesn't have to be expensive to be good. 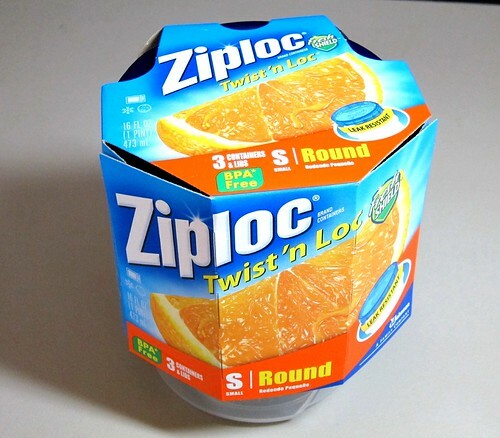 Ziploc's Twist'n Loc containers are a great multi-use backpacking item. After wandering the aisles at my local outfitter for a half hour, I walked out with just a pair of socks. Everything else I was looking for was just too heavy for my backpacking style. Afterwards, I ended up finding this 3-pack of Ziploc containers at the grocery store for just $3 US. The size small weighs 1.4oz, which makes it half the price and 0.4oz lighter than the pictured REI plastic mug. 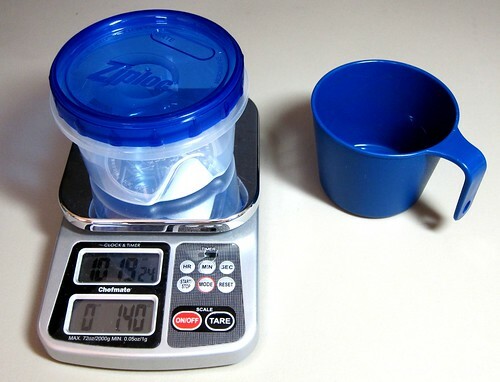 When you consider that the Ziploc container has a larger capacity (2 cups vs 1 1/2), and a lid, it seems like a no brainer. 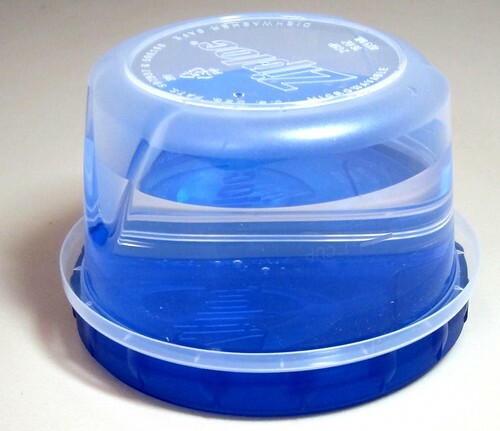 Since the lid has a water tight seal, you can also use it to carry extra water. There is a 1 cup marking on the side, which can be helpful for preparing meals. For enjoying a hot bowl of soup or a mug of hot coffee, you could make a simple cozzie for it, but I just put on my glove liners to insulate my hands from the heat. A versatile, UltraLight, UltraCheap Backpacking solution...perfect! Replace one of your water containers with this and it won't even add any weight to your pack! yes a very handy item. I use the 32oz container, the wide opening is perfect for treating water with a steripen. Nielson Brown, a great U/L application...thanks for sharing! Aaron, sounds like a perfect match for the steripen! Hi John- I've been using these exact containers in my kitchen at home for 3-4 years, they're very versatile. But, don't get too confident when carrying liquids in them, they will leak. I did a few tests with small containers, the link below will take you to my blog and test results. But, they're great for eating, drinking and carrying dry food or other small items in. John- I agree on the size of the container, it's so versatile. I wonder if there's an "O" ring available in the right size or maybe make one from a silicon mat. Also good for re-hydrating things like cous cous as you're hiking. I use these all the time-2 Cup version. I put my Muesli, dried fruit, grits, jerky, whatever in the night before with last of my boiled water at night. In am. everything is re-hydrated. THEY DON'T LEAK! You can eat cold if in a hurry or add new boiling water to warm up for bfast. Then I may pre-hydrate dinner and carry with me during the day. Ready to cook in pot for dinner, saves time fuel.